On second thought, maybe "eulogy" is too serious and dignified for this site. It's more like the Derek Zoolander version -- the "you-googly." Actually, I hadn't planned on reviewing another Dreyer's/Edy's flavor for a while. No particular reason; I'm just kind of burnt out on them at the moment. In fact, I was really looking for gelato rather than ice cream. But you know how, sometimes, something else catches your eye? This was one such time. 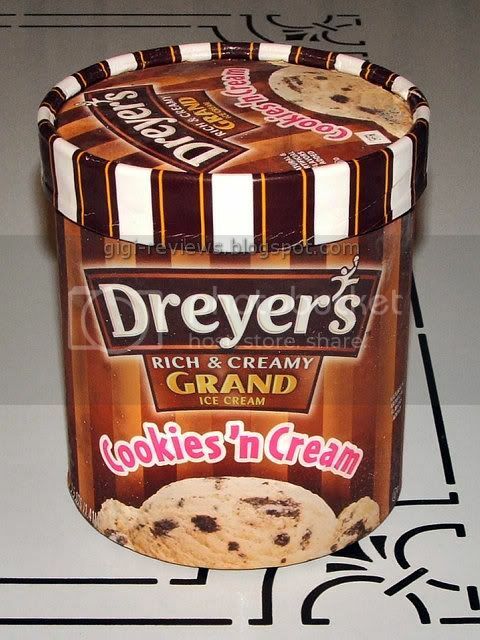 While browsing the supermarket ice cream cases, I noticed that my beloved Dreyer's Grand Cookies 'n Cream ICE CREAM seemed to be in the process of replacement by a probably adequate, but definitely NOT ice cream, Fun Flavors version. My goodness, both versions were on the shelf at the same time! (Caveat: I have not yet tried the replacement version, so I cannot claim first-hand knowledge. But I have eaten many of the other Fun Flavors, so I pretty much know what to expect). You see, folks, the issue at hand is that the Fun Flavors line is not ice cream. It is packaged to look like ice cream (and to be fair, how else would/could they package it? ), and it's placed in the same section as ice cream (again, it's not as if there are many options where to place it), yet it remains not ice cream. And it is made by a manufacturer with a long, rich, and creamy ice cream making history. "Frozen Dairy Dessert is defined as having more whey and less dairy and thereby it does not meet the standard of identity of Ice Cream as set by the FDA back in 1929. We at Dreyer's Ice Cream appreciate your interest in our company and our products. We value our consumers and we thank you for the opportunity to respond to your concerns. Well, there you have it. The product is not actually ice cream -- thus, for legal reasons they have to call it something else -- so "frozen dairy dessert" it is. To Dreyer's/Edy's credit, they don't make any claims that the Fun Flavors are ice cream -- and, for what they are, the Fun Flavors are a decent enough product. But it is still sad to see a company that built its good reputation over the decades by making actual ice cream, taking their signature product and downgrading it to an ever-decreasing portion of their core line. Yes, I know it's cheaper to produce -- and from a business point of view, I can see where the Fun Flavors line must be a better option for them. The profits have got to be higher than they are for the Grand line, when you consider that the Fun Flavors are sold in the same sized containers, and at the same prices as their ice cream counterparts; but the ingredients are not as costly. Yes, it does make economic sense. And certainly, in these financially turbulent times, every penny counts. I get it. Thirty second MBA review over, I definitely get it. Mind you, it's not that most other manufacturers didn't follow suit. Many did. In fact, I will use the sound-alike (but completely unaffiliated) Breyer's as a comparison. Breyer's is also one of the many companies that cut container size while keeping the same price, using preservation of quality as the justification. And to be fair to Dreyer's, Breyer's isn't exactly what it once was either. For example, Breyer's has started using mockolate and tara gum as examples of how they can manipulate their stance of using only all-natural ingredients that one can pronounce -- while at the same time cheapening the product. Well, yes, I can easily pronounce "tara gum," as well as the preferred term they use for mockolate -- i.e., "chocolaty chips" -- and I will grant that both are, in fact, natural. But by that logic, if you really want to get picky about it, snot is natural too...and I don't want snot in my ice cream either. At least it can be said of Breyer's that their core line was, and still is, actual ice cream and not some increasing number of pale imitations called "frozen dairy desserts." Dearest Dreyer's: if you are going to ditch everything we have grown to love about you in exchange for some younger, sleeker, but ultimately hollow trophy wife kind of replacement, couldn't you cut us some slack on the price tag? Personally, I will be taking my future Cookies 'n Cream dollars to the premium brands from now on. Yes, I know I will get less product...but what I will be getting will still be REAL ice cream. Businesses, no matter how cuddly they try to make their public faces, are not here to be your friend. They're more like that weird, gross Uncle Ray who you try to avoid at family functions. They put on a good show and remind you of how close you used to be, of the good times you had and all the stuff they got you as a kid, but by the end of the night you realize they are trying to bum money off of you. All any company really wants from you at the end of the night is your money -- I understand that, and am perfectly OK with it. But, if I am going to part with my money, please...at least try be more like Cousin Cody, who will still ask for that money at the end of the night, but at least promises to share the good stuff with you when he comes back. Give me something of quality in exchange. I am willing to spend my money. I am just not willing to waste it. Thank you for your email letting me know of your disappointment of not finding Dreyer's Grand Cookies and Cream at your local market. I realize how frustrating it can be to search for, but fail to find, your favorite frozen dessert treats. Unfortunately, this particular flavor has been discontinued from our Grand Ice Cream product line. It has been reformulated into our new and exciting Fun Flavor line. You can find our Fun Flavors at your local market. We are truly excited about this line of products and hope that you will be as well. I hope that you will be able to try our exciting Fun Flavors soon. I appreciate your taking the time to contact our company with your comments. Yep. There it is. You've read it, now you can weep. And if you don't mind, I have some tears to dab too. But please take a moment and view the slideshow presented below in loving memory of our latest fallen friend. I am with you 100 percent, except my tragic loss was the Dreyer's Original Rocky Road Ice Cream. If I wanted a frozen dairy dessert I would get a frozen yogurt. Just for your info if you have Blue Bunny Ice Cream in your area, the cookies and cream is fantastic. Good luck with your search for a new product! I have heard good things about the Blue Bunny- but it is not a brand my local stores carry. I can tell you Haagen-Dazs Rocky Road is pretty good. I really hope this turns into a wake up call to Dreyer's/Edy's. I can't remember how long we've (my bride and me) been eating "Cookies and Cream", I know that we were buying it four (4) containers a week, everyweek without fail! I even stayed after you shrunk the container, I was very loyal to "C & C", too bad I can't say the same about Dryers! That Blue container, you blew it! I was loyal to the end, but THIS is the END!!!!! That is a lot of cookies and cream my friend! I predict (although this is purely speculation on my part) that by the end of next year Mint Chocolate Chip goes the Fun Flavors route too. I was thinking about this and I have decided that I cannot complain about Dreyer's/Edy's cheapening of the products and feed the beast at the same time. From this point foreward there will be no future reviews (or purchasing for personal use) of any of the Fun Flavors. This does not mean a compleat ban on Dreyer's/Edy's products. I may still review (or buy for myself) the products that are still ice cream (there's 3 or 4 of them left) - or frozen yogurt. But the "Frozen Dairy Products" shall not make it into my cart. I just had the Phony Flavor of Rocky Road and it was bad. I did not know what was going on at first. The packaging makes it look like something special. The “Original” flavor of Rocky Road. Yuck! First I thought it was a plus like the limited run of Pepsi with real sugar. The other premium Rocky Roads I’ve had in the past are too rich and syrupy for me. What a shame. Any chance Cookies & Cream is coming back? As a Edy's/ Dreyers employee Im happy to tell you The " Fun Flavors" are on there way out! All the flavors will be returning to " Grand " They are slowly making there way out. I have delivered Cookies n Cream and Butterfinger Grand this past week! JS: I can't tell you how happy that makes me. I have been missing Cookies & Cream! WOOHOO!! Campbell's V8 Soup Give Away!